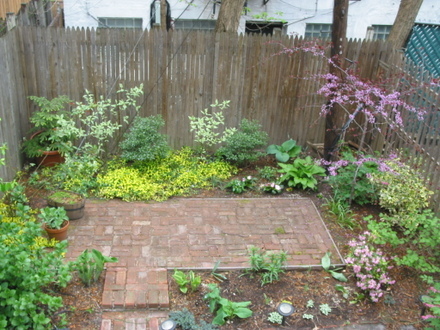 After moving to Brooklyn, we created a garden in the back yard. It was concreted over like many brownstone back yards, a concept that has been a source of great puzzlement to me...why would you want an expanse of sterile hard scape, prone to flooding and ugly to boot, instead of a garden? Reynolds is not alone in his mission to turn vacant lots into “flourishing urban oases”. There are thousands of people around the world who take it upon themselves to garden land they do not own in a proactive initiative to beautify their surrounding landscapes. The idea of guerrilla gardening was developed in the Lower East Side of New York in 1972 and has grown in popularity and become a direct action, quasi-political movement. The gardens spread throughout Manhattan and up to the Bronx, until they numbered close to 1,000 in the city as a whole. But they were victims of their own success. As areas were improved so they became safer and, eventually, gentrified. Once the land underneath a garden had become attractive to build on, the garden was threatened. A series of planning battles followed in the late 1990s, and a number of gardens were bulldozed and destroyed. Nevertheless, New York's guerrilla gardening movement has demonstrated what can be achieved. Many hundreds of gardens survive, and many have sprung up in other cities, including San Francisco and Vancouver. Essentially, guerrilla gardening makes unloved public spaces flower-filled by dropping seeds into the wasteland and allowing them to grow. In keeping with the terminology, guerrilla gardeners drop "seed bombs" (which you can order, naturally, via the net) surreptitiously as they find open plots of land. What a beautiful garden you have! You managed to have such wonderful garden with a small area.